The top line in the three-range Elddis portfolio may not have had the farthest-reaching makeover among its 2016 models, but it is arguably the most dramatic. And Elddis should be applauded for doing something different – whether or not the new ‘Champagne’ sidewalls and bronze gas-locker lid are to your taste. We were unsure at first, but the more time we spent with this new Aurora, the more we liked it. Under that new skin there are few fundamental changes, but little was wrong with it in the first place. This is a high-spec, well-built tourer, aimed at caravanners who don’t want to stint on luxury. Unlike its two transverse-island-bed Crusader siblings, the Aurora features an in-line island bed to the rear, with a split washroom across the middle of the van. It’s a motorhome-style layout that we’ve seen before in Elddis caravans, most recently in the Avanté and Affinity 550, but it works particularly well here. If you're a couple looking at caravans for sale, this van has a lot to offer. As with all Explorer Group products, the Crusader uses fully bonded SoLiD construction, with one-piece aluminium sides featuring a fixing-free awning rail, plus an impressive 10-year water-ingress and body-integrity warranty. Like all of its stablemates bar the Buccaneers, it sits on an Al-Ko chassis rather than the BPWs of old. It should prove effortless to pitch, too, with easy-to-access bolts for all the heavy-duty steadies. Less appealing is the fact that the toilet cassette is accessed on the nearside – not ideal if you have an awning fitted – but this is a small quibble and the Aurora regains ground with impressive spec, including a gas barbecue point, a Diamond wheel lock and a Thatcham Category 7 Tracker, including a year’s subscription. The lounge will only seat four, unless you’re willing to squish up, but this is resolutely a couple’s van. Those four will sit in genuine comfort, with thick sofa cushions and end bolsters for all – even the usually open nearside rear, thanks to a slot-in blade support. The AquaClean stain-resistant upholstery introduced last year continues, but in a new and pleasant pale colour scheme with purple accents, set off by the light ‘Marone’ timber effect. The heavy window tinting that gives the exterior such style isn’t too dominant once you’re aboard, and the ‘Sky-Scape’ panoramic sunroof brings in extra light. It’s joined by a large Heki rooflight, and the two are neatly integrated by a new leatherette surround. Elddis has taken a leaf from rival Swift’s books with plenty of spotlights, plus LED ‘feature lighting’ under the worktops. It’s good to see the addition of a pair of USB points in the front shelf alongside a 230V socket, and there’s an obvious position to site your television on the narrow shelf beside the entrance door, where there’s an aerial point and another socket. There’s no mistaking the galleys of 2016 Explorer Group caravans, thanks to the new whitewash-effect cupboard doors – which Elddis calls ‘Fantasie Brushed’. It’s effective, and there’s a decent amount of storage along with plenty of worktop, so there’s no need for an additional flap. Cooks will take pride in this kitchen, which has useful domestic touches such as a decent-sized bin mounted on the door, and a proper square sink rather than a shallow bowl. There’s no complaining about the spec, either, led by a microwave (sited, unfortunately, directly over the hob), an Omnivent, two 230V sockets, a 110-litre fridge/freezer, an oven and grill, and a dual-fuel four-ring hob. We like the neat concealed cutlery drawer, too, though we’re less wowed by the brown-tinted Perspex drinks cabinet on the opposite wall. The idea of a washroom split across the centre of the van initially seems a compromise, but in reality it provides several benefits. Key among them is that it can either be a family washroom, shared with the rest of the caravan by pulling a screen across to close off the master bedroom, or a true en suite, created by pulling the piano-hinged toilet door fully open to latch against the kitchen bulkhead. The result is a space that feels very special – and large. There’s no window in the washroom, but there is a big rooflight and it’s a well-finished space, with an attractive splashback, a large mirror above the sink and a cabinet. There is a heated towel rail plus a convection outlet for the Alde wet central heating to make this a toasty-warm, all-season tourer. The large, circular shower cubicle has doors that are held shut by a powerful magnet and for 2016 gains the new Ecocamel Orbit water-saving showerhead, to make the most of the 40-litre on-board water tank. If you exhaust that, the auto changeover system switches to an Aquaroll. Having the washroom split across the centre of the caravan means that there’s a less open feel than you’ll find in an end-washroom tourer, but when it comes to night-time that can be a bonus. The rear bedroom feels like a separate, private area, to create a more domestic feel. For 2016, Elddis has altered the base mechanism system for its island beds so they can be retracted a full 400mm during the day; this makes much more sense, because it clears a meaningful amount of space. It’s the easiest we’ve come across to set up at night, too; the bed slides smoothly and the wedge-shaped mattress top – which makes an ideal backrest for daytime reading – flips into the gap. When extended, the bed is a huge 6ft 3in long, and features a comfortable breathable Ozio mattress. Each side gets a lamp and a shelf, and there’s a backlit headboard for 2016. Adding to the homely feel is a thick-pile carpet and proper domestic-style chrome curtain poles rather than a cheap-feeling track. A small vanity unit on the offside beside the shower is ideal for getting ready in the morning, with a shelf, a mirror and a socket for your hairdryer. On the opposite side, you’ll find an aerial point but no TV bracket, though that should be easy enough to fit. Although this is a van for couples, there is room for guests at the front, where the sofas combine to form a long but relatively narrow double bed. Throughout this caravan, there’s a real sense of quality to the cabinets, handles and drawers. All overhead lockers have positive catches operated by nifty rotating handles. A pair of them in the bedroom join the two in the lounge. Unusually for a top-spec tourer, there is no external access to the under-bed storage, which may make stashing wet or muddy gear a bit of a pain. You may also find overall storage space limited if you regularly tour four-up, with much of the under-bed space taken up by the water tank and a pair of radiators. That said, unlike in a transverse-island-bed van, where the wardrobes tend to be compromised, in the Aurora there are large hanging wardrobes on either side of the bed, each with three deep drawers beneath. 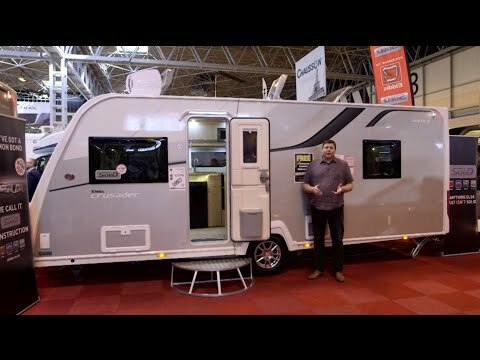 The 2016 Elddis Crusader Aurora follows the ‘if it ain’t broke don’t fix it’ mantra, and the tweaks for 2016 serve only to improve an already desirable caravan. The bold new looks should make it stand out, and the addition of this new layout should prove seriously tempting for couples who seek luxury above all else.